While I know it’s not technically fall yet, and it’s still warm out,it feels like it’s on it’s way! I hope the frost holds off for a long time! I planted some late season beans, and hope to get a picking or two in before the big frost hits. 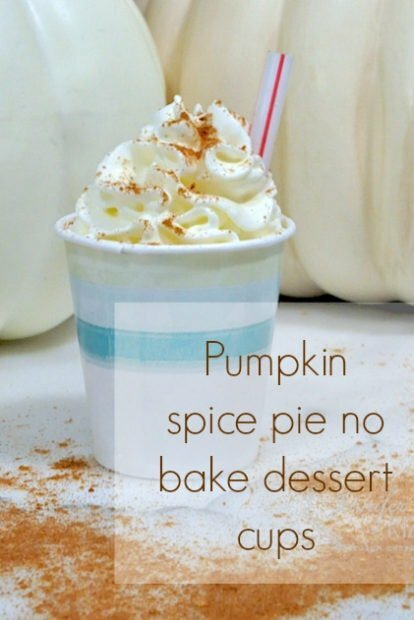 Today, as a part of the Seasons of Home holiday series, I am sharing a look at my early fall kitchen, and a recipe for yummy pumpkin spice pie dessert cups. Since it’s early fall,real pumpkins aren’t quite out yet. As a blogger that’s always an issue. I need pumpkins for about 40 things right now. I added some late summer harvest touches to my kitchen such as apples and sunflowers. 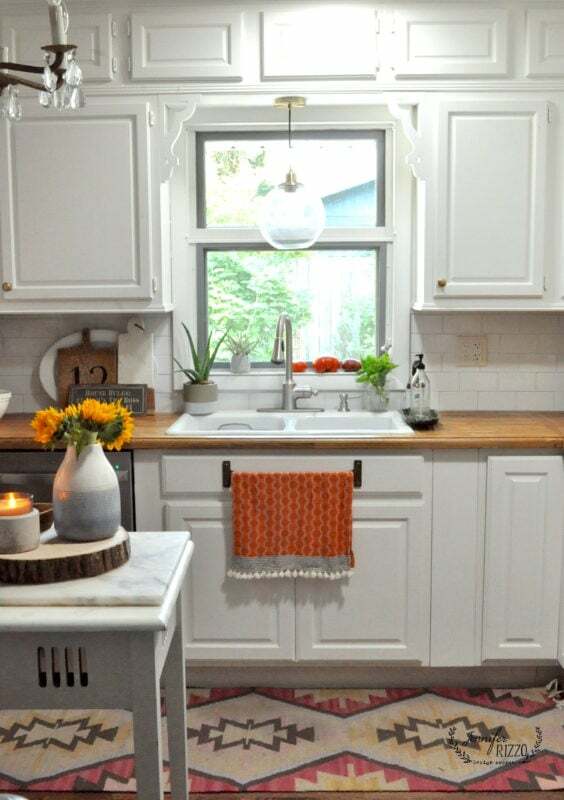 It still love my subway tile backsplash, and am so glad we did it. 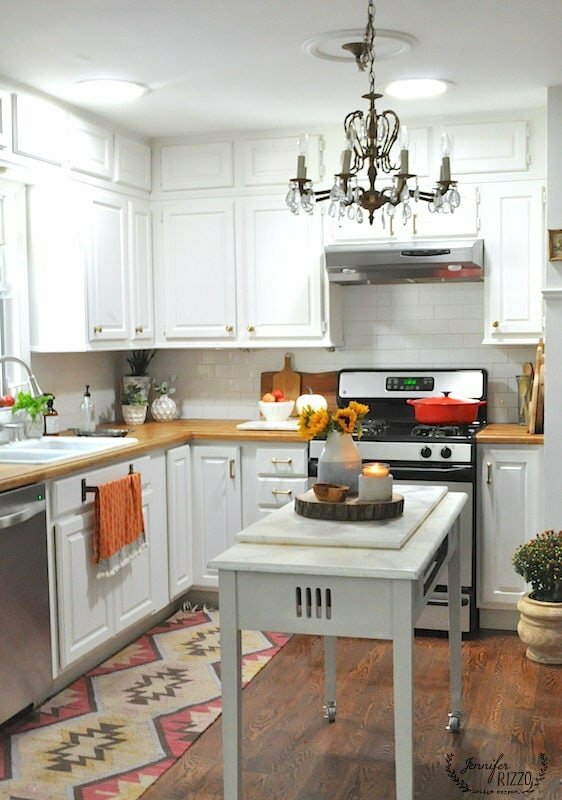 I am still looking for a new kitchen island. This one is fine, it’s an old desk, but I would like to find something with a little more character, and a shelf underneath. I also love the new light. It’s nice how small upgrades can make a huge difference. 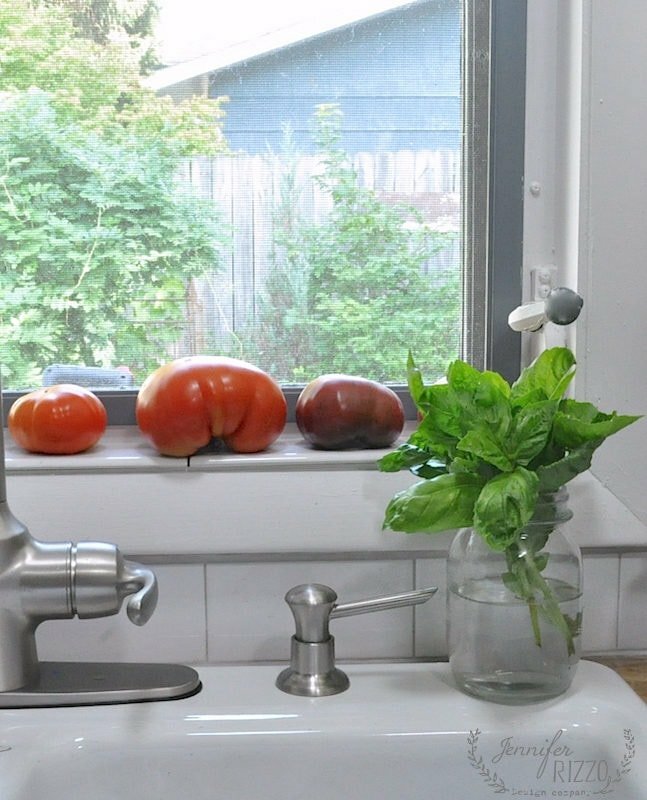 This is basically what I have on my kitchen window every single day. Ignore the off-white outlet cover. I haven’t had time to change it out, I look at it every single day and think ” I really need to get to that.”, and then I forget. I might just paint it for now just so I can let it go. We’ve been getting lots of yummy tomatoes from the garden, and this has been a good year for basil too. I pick it, and keep it in a jar at the ready. The nice thing about basil is that it roots it water. If I forget about it and it starts to root, I plop it in the garden and make more plants! I love being able to make more plants that way! I also have an air plant and Aloe vera on my sill. The Aloe always comes in handy! I made some yummy pumpkin spice pie no bake dessert cups the other day. They were a fun and easy treat, and are pretty cute too.They taste like pumpkin pie. I put them in dixie cups with a straw cut down for a cute presentation. 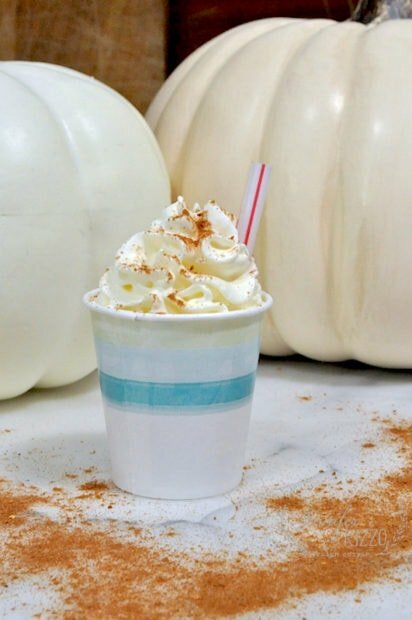 Just like a mini-pumpkin spice drink. Mix pumpkin puree into cold milk and mix thoroughly. Adding pudding mix and stir. Add 1 tsp pumpkin pie spice mix, stir, cover and place in refrigerator. While that chills for about 5 minutes, put a vanilla wafer in the bottom of each cup.After the pudding is softly set, take mixture and spoon about a tablespoon on top of each cookie, add another cookie, and then one more tablespoon, so you have two layers. Cover and chill. Let set at least 3 hours to overnight. This will soften the cookies. 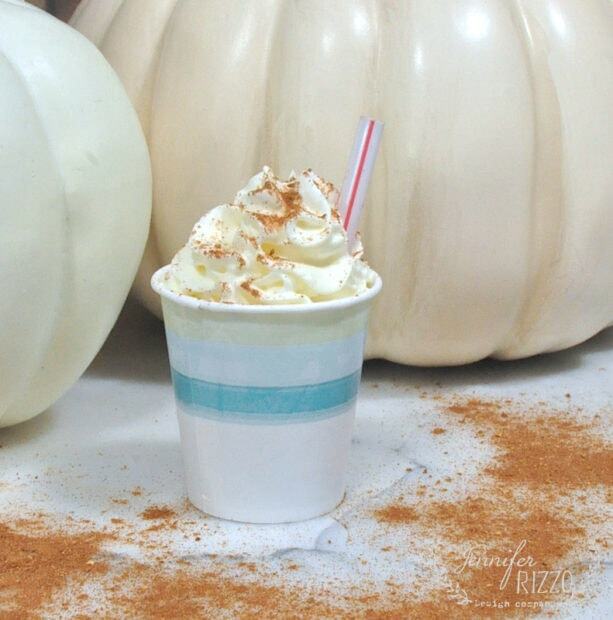 When serving, add whip cream and sprinkle pumpkin pie spice on top. For additional cuteness, you could add a rolled, edible cookie as a straw instead of a real one. Everyone in our house loved them, in fact the kids have been sneaking them. We went from twelve to about 4 in 2 days. Make sure to visit the other bloggers on the Seasons of home holiday series! We have a fun things going on all fall and winter! I always love getting a peek into your beautiful home. Toss in a pumpkin dessert and I’m in heaven. Thanks for sharing. 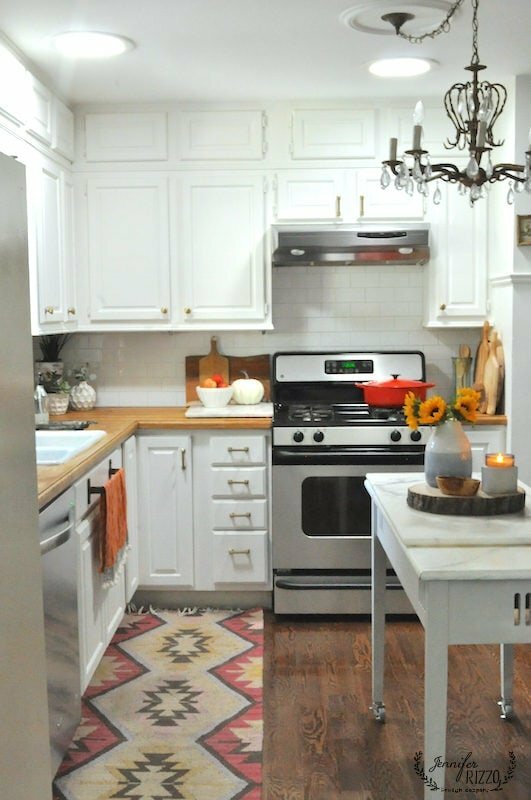 I love all of the warm colors in your kitchen Jen! And that dessert looks yummy! Where did you get the rug under your sink? I love it and have been looking for one. Thank you Becky, it was from Target. Where did you find the runner/rug? 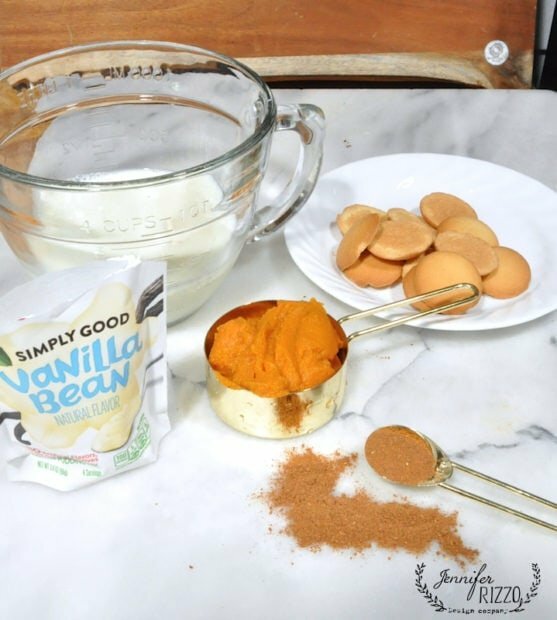 Your kitchen is lovely, and I am always up for a no-bake pumpkin dessert! Looks great, thanks for joining in! 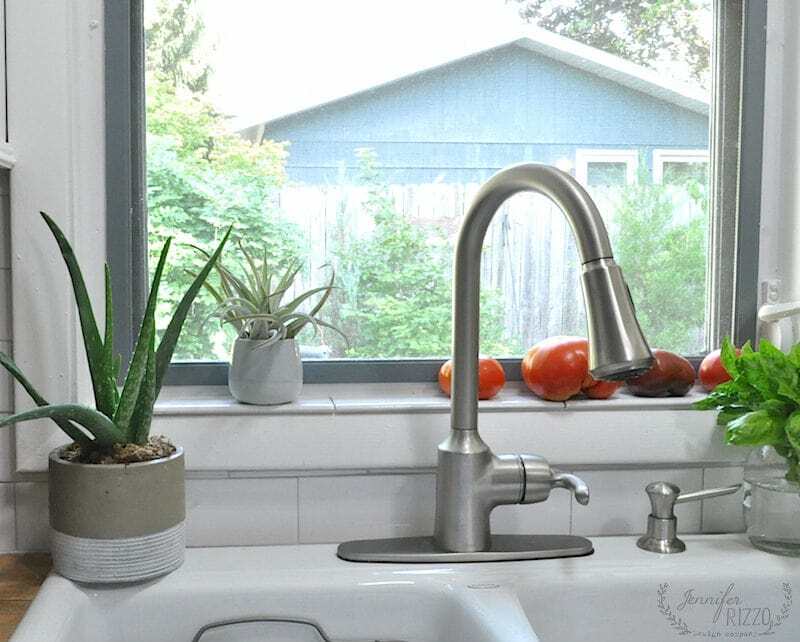 Love the changes you have made in your kitchen this past year Jen! 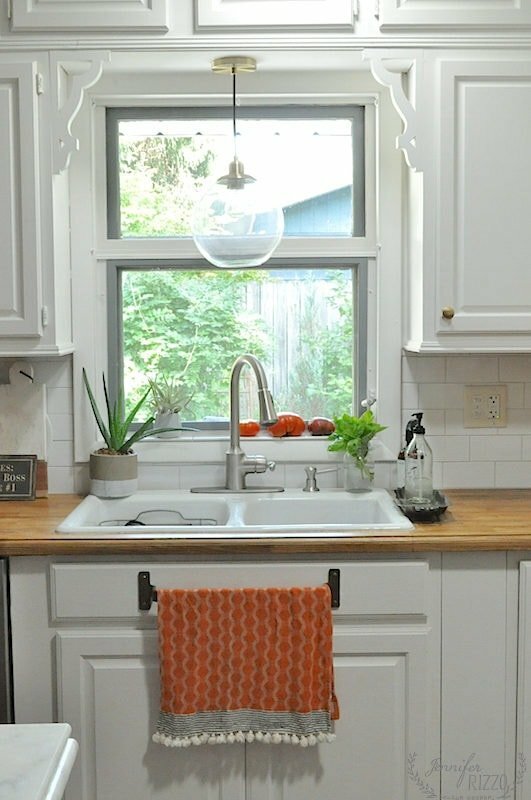 The backsplash tile and the new runner…. everything looks so bright and charming.